Join Upper Deck for an Interactive Football Draft Recap Event on BreakersTV! BreakersTV has become a hub for collectors to check out new products and participate in group breaks. With the draft concluding over the weekend, many fans are making determinations about which 2014 football rookies to chase. For the first-time ever, Upper Deck will run an interactive event where staff will provide their thoughts on the draft and which rookies they believe have the most potential upside. Oh, and there will be FREE GIVEAWAYS where fans who pre-register for the event can score a variety of 2013 and 2014 Upper Deck Football products. The event will take place LIVE on BreakersTV from 4:00 p.m. PST – 5:00 p.m. PST on Tuesday, May 13, 2014. Log in at 4:00 p.m. PST, watch and participate in the discussion. Upper Deck staff will talk about new rookies, current products and upcoming sets during the hour-long show while opening and giving away a variety of 2013 and 2014 products including one pack of the brand new 2013-14 Upper Deck Quantum Football! 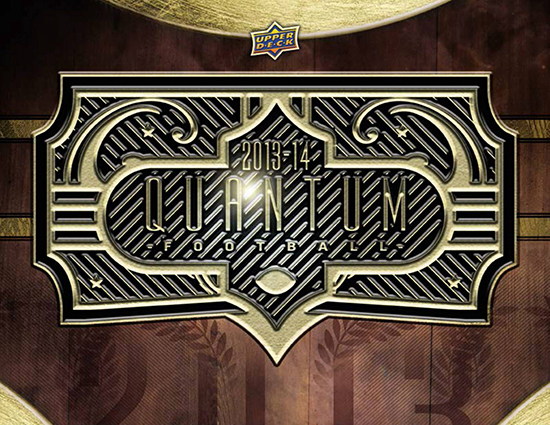 Fans who pre-register have the opportunity to score a FREE pack of 2013-14 Upper Deck Quantum Football that will be opened LIVE during this unique interactive event! This is just another way Upper Deck continues to give back to the hobby during our 25th Anniversary celebration through this one-of-a-kind event! Don’t miss it and email us to register now! *One entry per household and fans need to tune into www.breakers.tv/udccarlin to participate on Tuesday, May 13, 2014 at 4:00 p.m. PST. Very nice football cards. I like the box topper extra pack. Nice base cards too. Can’t wait for Interactive Draft Recap!! !